Once thought of as a substance that brought on hysteria, delusions and even hallucinations from those that ingested it, thankfully, marijuana-related propaganda has cooled in the last decade plus. In the post-“Reefer Madness” world and in a country that has long realized the war on drugs to be a colossal failure, states are starting to take on a more liberal approach toward the legalization – for medicinal or recreational use – of marijuana. Currently, there are 4 states with legalized marijuana: Oregon, Alaska, Colorado and Washington. Twenty-three more have either decriminalized or enacted laws allowing for medicinal usage. The entire country, it seems, has shifted in its thinking surrounding the substance. Even in the 4 states where marijuana is currently legal, the proprietors behind grow operations and dispensaries are having real trouble on the financial side of things. While the typical small business owner can take his or her business license into the local bank and open an account, and perhaps even apply for a small business loan, the so-called “Cannapreneurs” (that’s cannabis entrepreneurs for those scoring at home) aren’t privy to the same sort of luxuries. Banks have essentially shut out the cannabis industry even with its lucrative profit margins and exponential growth over the last two decades. Even completely legal – and lucrative – businesses are having real trouble obtaining the financing they need to move into a new location, purchase inventory, or expand into new markets. 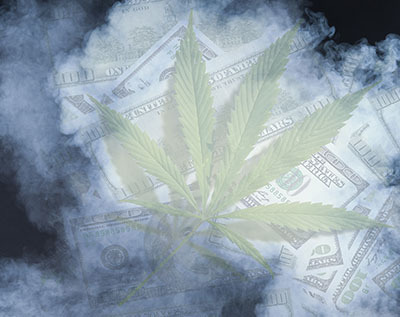 Residing in the grey area between the legalized marijuana in specific states and the ban on the same plant at the federal level, banks are caught in the crossfire. Those who do loan money are straddling a line between legal and illegal and the consequences – should they choose to be enforced – could be devastating to any of the major banks. If you’re confused, you’re not alone. This proverbial grey area exists solely due to the inaction of the federal government in keeping up with the laws at the state level. In fact, this problem could run even deeper as at least five states plan on voting on whether to enact recreational marijuana usage laws in 2016. Currently, the marijuana industry is at a crossroads. Without the financing to grow these fledgling startups, the industry at a whole is feeling the weight of the financial crunch. In a world where there is plenty of cash in safes (because the banks cannot accept their deposits), many are paying cash for much of their needs, including real estate, warehouses and so on. I mean, why leave the cash in a safe? While existing businesses and cannapreneurs with strong financial relationships are often tight-lipped about their funding sources, that’s not to say that this type of capital injection isn’t available. That said, the hoops you have to jump through often make it a less-than-desirable exercise in patience and ingenuity. It is possible to get investors from this cash reserve of Cannapreneurs; proving you can find one. Institutions like Simplified Capital have risen in the ranks recently due to the simplification of this process. Unlike several others that finance cannabis-related startups or small businesses, Simplified Capital only asks for someone with good credit, and a profitable idea. Cannabis dispensaries grow houses or even accessory producers are attractive investments for lenders and entrepreneurs. With great margins and growing acceptance amongst the populace, the industry is set to explode, and all that appears to be limiting that is the amount of capital available to those within the industry. No one can say when – or if – the federal laws will catch up to the changing times, but if I were a betting man, I’d assume that sweeping nationwide legislation to regulate and tax the booming marijuana industry is not far off. Until then, we can only hope to see some semblance of clarity to existing laws that allow a legal industry to operate, well, like a legal industry. Time will tell.